The Pilgrim’s Credencial or accreditation is the document given to pilgrims in the Middle Ages as a safeguard. Today there is an official Credencial model distributed and accepted by the Office of Pilgrimages of the Diocese of Santiago. 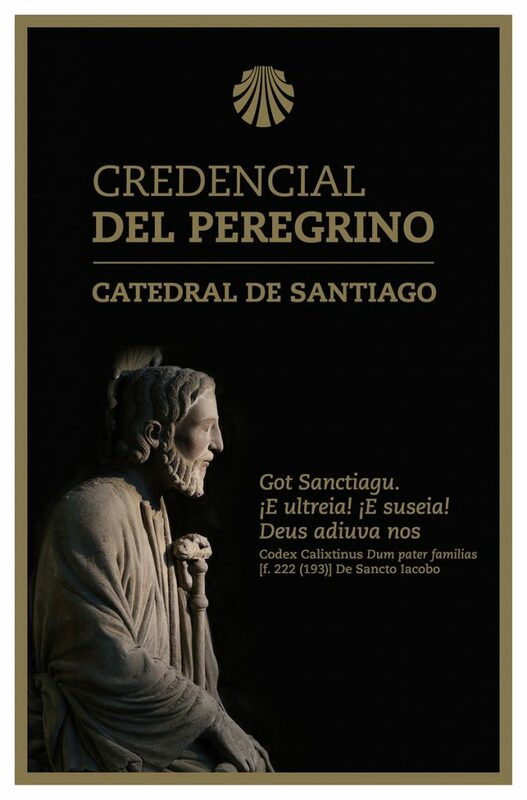 You can get it by requesting it in person at the Pilgrim’s Reception Office or other institutions authorised by the Cathedral of Santiago for their distribution, such as parish churches, Associations of Friends of the Way of St. James, pilgrim hostels, confraternities, etc. In Spain and abroad, some associations related to the pilgrimage have been authorised to distribute their own Credenciales with a reference to the goal of the pilgrimage at the Cathedral of Santiago. In any case, official Credenciales are available both in Spain and abroad; to receive information about Credencial distribution sites in your country, region or city, please see the links at the end of this section. The official Credencial and others recognised by the Cathedral of Santiago are printed on cardboard and consist of sixteen concertina-folded pages. The first pages are illustrated in the photo accompanying the text. The first page is like a cover letter and should be completed at the place of issue with the Pilgrim’s data. 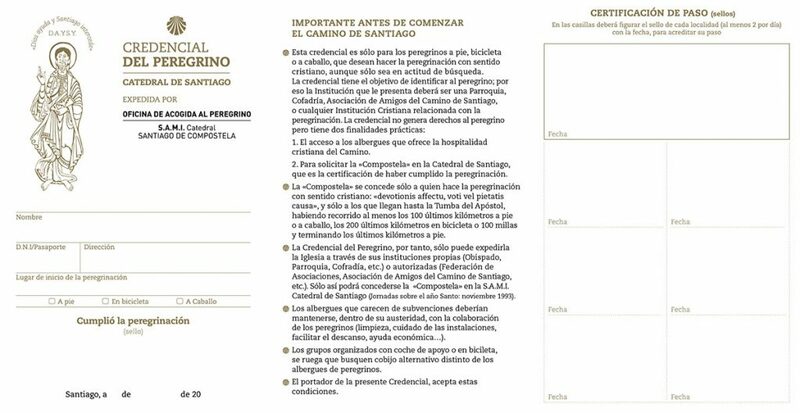 There is also a space at the top for the seal of the place that issues the Credencial; at the bottom of the same page, the date and the Cathedral’s stamp will be placed after completing the pilgrimage. This Credencial is only for pilgrims on foot, bicycle or horseback, who wish to make the pilgrimage with a Christian sentiment, even if it is only with an attitude of search. The Credencial has the purpose of identifying the pilgrim; which is why the institution that issues it must be a parish church, confraternity, dioceses, Association of Friends of the Way of St. James, or any Christian institution related to the pilgrimage. The Credencial does not generate any rights to the pilgrim. It has two practical purposes: 1) access to hostels offered by the Christian hospitality of the Way, 2) serve as certification in applying for the “Compostela” at the Cathedral of Santiago, which certifies you have made the pilgrimage. The “Compostela” is only granted to those who make the pilgrimage with Christian sentiment: devotionis affectu, voti vel pietatis causa (motivated by devotion, vote or mercy). And it is only granted to those who make the pilgrimage to reach the Tomb of the Apostle, doing in full at least the last 100 kilometres on foot or horseback, or the last 200 km by bike or 100 nautical miles and last km on foot. Therefore, the pilgrim’s Credencial can only be issued by the Church through its institutions (Bishopric, Parish, Confraternity, etc. or, in any case, through institutions that are authorised by the Church). This is the only way the “Compostela” can be awarded at the S.A.M.I. Cathedral of Santiago (Conference on the Holy Year: November 1993). Hostels that receive no subsidies must be maintained, within austerity, with contributions from pilgrims (cleaning, looking after facilities, facilitating rest, financial aid…). Groups organised with support car or by bicycle are requested to seek alternative shelter to the pilgrim hostels. The bearer of this Credencial accepts these conditions. The remaining pages of the Credencial contain boxes for the stamps along the pilgrimage route. The stamps are normally collected at the places where the pilgrims sleep, such as hostels, but they can also be obtained in parish churches, monasteries, cathedrals, hotels, town halls and other places. St. James, Apostle, chosen among the first, you were the first to drink the cup of the Master and you are the great protector of pilgrims. Make us strong in faith and happy in hope on our pilgrim journey, following the path of Christian life, and sustain us so that we may finally reach the glory of God the Father. Amen.